Actually, it is still very common in my home country, Indonesia. When you open newspaper, you'll see a lot of jobs openings like: "female, attractive, max 27 years old, blah, blah...."
Definitely Canada, US, and Europe, but maybe not the world. 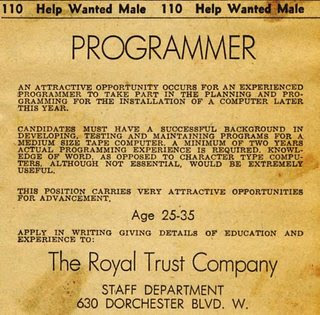 A few years back I was looking for work in Central and South America, and many job ads for a computer programmer wanted a male between the ages of 25 and 35. Plus, the resume must include a picture of yourself. I've seen quite a few international resume floating around the net and I'm always surprised to see it when they state things like: height, weight, religion, age, gender, etc. That's not that long ago, really. In my mother's working life married women in Ireland had to quit govt jobs. How far we've come! I'm a woman who works in the construction industry. I see a lot of ads for work in the middle east (my uncle is among many many Irish people in the biz over there) that specify male applicants. Can't remember the exact language. I wouldn't fancy working in Saudi anyway, but it always gets my blood pressure up!